“Pasos de Tatin” a prehistoric stepping stones structure settled into the Tea river to allow pedestrians to across a natural watercross. This structure was built by our ancestors since ancient times. The Tea river, is one of the most historical rivers of our land. The river passes through the Sabaxáns’s parish. This is the point in which we can find the Tatin´s stepping stones. The structure are located in the middle of a precious place in which abound centenary old oak trees (called “carballos”). Among diverse commercial routes in ancient times the Tea river was crossed by Santiago´s Royal Way. 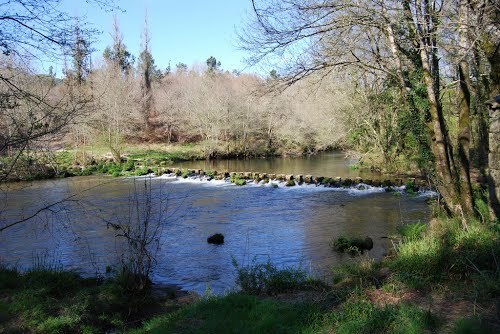 The stepping stones are named “poldras” in the local language, and its origin dates back to the Neolithic period, and it was used by Galician people as a footbridge with an invaluable antiquity. In the “ Pasos de Tatin” location there is a water mill in which we can get inside. It´s a nice historical set surrounded with beautiful nature.